Is Texas Really Turning Blue ? One of the apparent silver linings of an otherwise disastrous 2016 presidential election was Donald Trump’s relatively poor performance in Texas. Trump bested Hillary Clinton by 9 percentage points in Texas, a far slimmer margin than the 16 percentage points by which Romney triumphed four years earlier. Why did Trump do so poorly relative to previous nominees? My prior assumption, likely shared by many others who were too depressed to dive into the data, was that, in addition to increased Latino turnout, Clinton’s appeals to educated, white-collar Republicans that had fallen so flat in the Rust Belt had actually worked in the suburbs of Houston, Dallas and Austin, leading many country club Republicans to stay home or vote for Hillary. That was until I read an analysis by Ed Espinoza, a long-time Democratic strategist who runs Progress Texas, a liberal outfit based in Austin. He pointed out that Trump’s narrower margin was most likely the result of new voters coming out for Hillary, not Republican voters deserting their nominee. Indeed, Trump won Texas by a far slimmer margin than the three most recent GOP nominees despite the fact that he got more overall Votes here than any presidential candidate in history. It’s pretty simple. Trump got about what you’d expect a Republican candidate to get based on recent performances. In 2008, John McCain got 4.48 million votes. In 2012, Mitt Romney got 4.57 million, an increase of 90,000 votes. And in 2016, Trump got 4.68 million, an increase of 110,000. In contrast, Hillary Clinton got 557,000 more votes than Obama. Simply put, the Texans who died today were disproportionately Republican. Of those who turned 18, the great majority are Democrats. 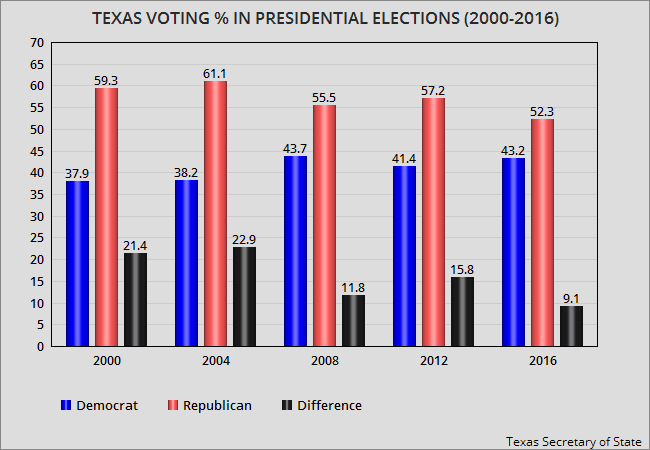 If this trend continues, the GOP’s downfall in Texas isn’t likely, it’s assured. And without Texas, the national GOP is royally screwed. I went back and checked the presidential results for this century for Texas (at the site of the Texas Secretary of State). The charts above show the results for those five presidential elections. The top chart shows the vote totals, and the second chart shows the percentages of the vote for each party's candidate. Mr. Craver is correct. Clinton came closer than Obama, Kerry, or Gore in carrying the state -- with a smaller percentage los and a smaller difference in raw votes. And both the percentage and vote totals seem to be trending toward Democrats. But don't hold your breath waiting for Texas to turn blue. Clinton still lost by 9 points and 810,000 votes. That's a significant difference, and shows it could still be a while before Democrats can carry Texas in a presidential election. Texas Democrats should take heart though -- the demographics still favor them in the long run, and with some work maybe that time could come a little sooner. Texas is going to turn blue -- just not as fast as some of us would like. Having said that, I do think Beto O'Rourke (the probable Democratic candidate for Senate) has an outside chance of beating Ted Cruz. Cruz is not very popular. O'Rourke is a personable candidate and good campaigner. And Democrats are fired up. 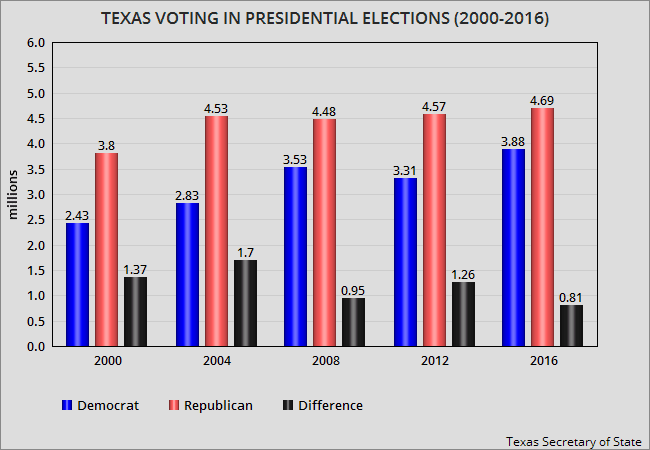 Texans normally don't vote in the off-year elections in very large numbers (in either party). If the Democrats can use the dislike of Trump to get large numbers to the polls, and too many Republicans stay at home -- the miracle could just happen.